For the past few years, ever since my oldest daughter started school I’ve been a faithful collector of Box Tops, those handy little coupons on the tops of most General Mills products that you clip, save and then send in to school. It took me a little while to get the hang of learning which products carry Box Tops – and in the process I came to realize just how many brands fall under the General Mills umbrella – everything from Betty Crocker instant potatoes to Huggies diapers and wipes. Since then, I’ve amassed quite a collection of Box Tops, that I keep inside a plastic container (used to have Kleenex wipes in it – and it works perfectly to store my Box Tops in!) in the kitchen. My usual routine is to quickly tear them off of whatever package they came on before it gets thrown away and store them. Then every so often, when I have a few minutes while waiting for water to boil or something to heat in the microwave, I pull out my Box Tops and trim them. That way when there’s a collecting contest at school, we’re all set. My Box Tops collection has grown quite a bit recently, and our grocery budget has shrunk – as we had the opportunity to shop at Sam’s Club and take advantage of their BIG CLIP campaign, courtesy of a Sam’s Club membership that we received courtesy of Sam´s Club and MyBlogSpark. Through September 4, you can get extra Box Tops coupons on your favorite back-to-school brands at Sam´s Club and maximize your earnings for your school through the Big Clip campaign. As a double benefit, your savings on these favorite brands will pay for your membership because at Sam´s you can save over $40 on these brands compared to grocery store prices – which essentially pays for your annual membership fee. Participating brands include: Cheerios, Ziploc containers, Ziploc sandwich bags, Honey Nut Cheerios, Pillsbury Chocolate Chip Cookies, Fiber One Oats and Chocolate Bars, Nature Valley Bars, Scott Paper Towels, Huggies Baby Wipes and Kleenex Facial Tissues. Box Tops For Education is an easy way for schools to earn money. Every Box Tops coupon that you clip and send to your child(ren)’s school is worth 10¢ – which adds up quickly when you have a whole school’s worth of parents collecting them. There are other ways to earn money for your school through the Box Tops program however – and they have just launched a brand new website at http://www.boxtops4education.com that will walk you through all the ways that you can help. If you shop online, you can earn even more by starting from 100+ stores listed on the Box Tops For Education website – and the site clearly tells you what percentage of your purchase will be donated through the program. Plus they list coupons and other special offers that you can take advantage of at your favorite retailers as well! We used to have a Sam’s Club membership quite a few years ago, but hadn’t re-joined since we moved here. I really had quite forgotten just how many big bulk items you can buy there – things that we use on a daily basis. And I was also amazed to see how many of those items are involved in the Box Tops program – last time I’d shopped there we didn’t have any kids in school yet. We went as a family to activate our new membership, and took a few hours to walk through every aisle of the store and reacquaint ourselves with what they have to offer. While doing so, we filled up our cart with quite a few items – many of which were part of the Big Clip campaign. 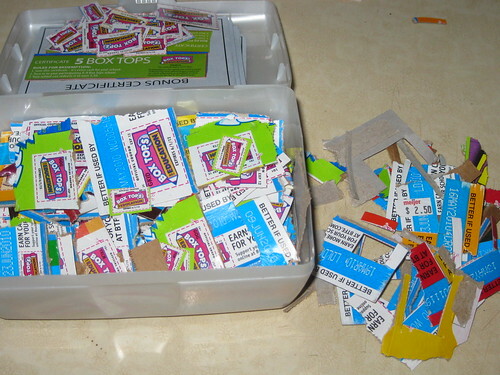 On the large boxes of cereal that contain the equivalent of two ‘normal’ sized boxes, there were Box Top coupons worth 5 Box Tops each, rather than the one or two that you would normally get. The girls were extremely helpful with the shopping – and the cereal aisle was their favorite. They ran from one end to the other exclaiming as they saw their favorites (almost all of which are coincidentally from General Mills), and I had to laugh as I saw them carrying huge boxes that were almost as big as they were. Can you guess what their top choice was? 🙂 Even my 3-year-old had to step in to help put her favorite cereals in the cart – all by herself, of course. 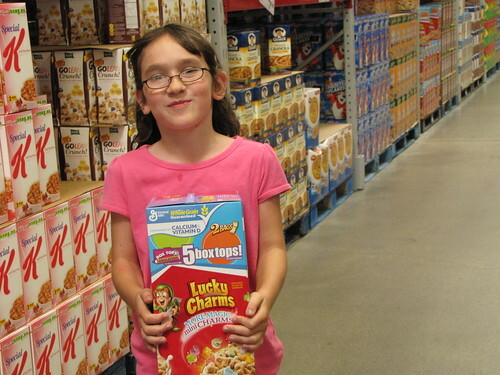 In the end, we came home with a total of 40 Box Tops just from this one shopping trip – and with the kind of money we can save by buying cereal and other groceries in bulk at Sam’s Club, we’ll be shopping there regularly during our membership year. I’m glad to know that there are so many of our favorite brands available there – and so many products which participate in the Box Tops program as well. From cereal to yogurt and snacks, we will be all set. At the end of our shopping trip, we had a cart full of groceries, some very excited kids, and a couple of happy parents who were thrilled with the amount we saved – and the amount of Box Tops we earned. Whether during the BIG CLIP back-to-school period or just every day, you can earn Box Tops for your school when shopping at Sam’s Club. They carry a great selection of Kimberly-Clark, Betty Crocker and other General Mills brand products and with the savings you’ll get by buying in bulk, you’re helping not only your school but your own bottom line as well. You can find out more information about Sam’s Club, including where there’s a location near you at http://www.samsclub.com. There is more information about the Box Tops for Education program (and the Big Clip campaign) at http://www.boxtops4education.com. You can sign up there to see how much money your school has earned and to contact the Box Tops coordinator for your school. In addition, you can also enter The Big Clip sweepstakes for a chance to win the Grand Prize of 500,000 Bonus Box Tops or one of two first prizes of 250,000 Bonus Box Tops! Enter by visiting the leaving a comment here to let me know your favorite product(s) that participate in Box Tops. Please don’t just say ‘choose me’, or your entry will be discarded. The contest will run until Wednesday, September 16th at 11:59 pm EST. The winner will be selected through random drawing, contacted by e-mail, listed on this post and also submitted to PRIZEY. US entries only, please. Please leave a valid e-mail address or other way to contact you! If the winner hasn’t responded within 3 days, an alternate winner will be chosen by random drawing. Subscribe to my RSS feed (click on the orange icon in the upper right sidebar) or subscribe via e-mail – leave me a separate comment to let me know. Mention this contest on your blog with a link back to this post, and leave a separate comment with the link to your post so I can find it. Either Twitter about, ‘Digg’ or ‘Kirtsy’ this post – leave me a separate comment with your username at whichever site(s) you chose (one extra entry per method). Become a ‘fan’ of this site on Facebook – there’s a link in the sidebar or you can click here. So that’s a total of 7 comments/entries if you do all of the extra entry options. Stephanie G. (no blog), whose extra subscription entry has won the grand prize for her. I will be e-mailing each of you shortly to work out the details! This post courtesy of: Sam´s Club and MyBlogSpark. No payment or compensation, other than the one-year Sam’s Club membership as described above, was received for this post.